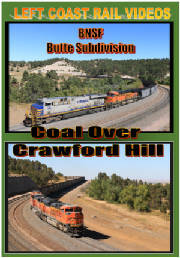 BNSF and UP non stop action at Crawford Hill, Nebraska. Available on DVD and Hi-Definition Blu-ray. 16 x 9 widescreen viewing format. You must have a Blu-ray player to play Blu-ray disc. 2 hrs-26 min.